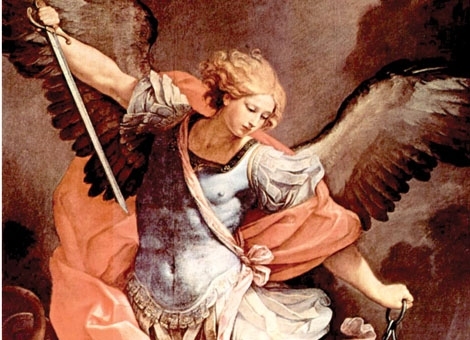 According to the Fathers of the Church, St. Michael was honored as guardian angel of the people of God, and fulfilled the role of defender during the time of the patriarchs onward. They also stress the fact that, in many events throughout the Old Testament, the appearance and assistance of an unnamed angel is believed to be Michael, the Archangel. To be the champion of God's people; the Israelites under the Old Law, and now the Catholic Church. In 1884, Pope Leo XIII received a shocking vision regarding the Devil ravaging against the Church. Shortly after the experience, he composed the short prayer to St. Michael to be included in the prayers after the end of a Low Mass. Pope Leo XIII said that he heard, seemingly from the tabernacle, the voices of God and the Devil. The Devil proclaimed that he could destroy the Church if he had time and power (75-100 years) to which God answered, "You have the time, you will have the power. Do with them what you will." Saint Michael the Archangel, defend us in battle; be our safeguard against the wickedness and snares of the devil. May God rebuke him, we humbly pray: and do thou, O Prince of the Heavenly Host, by the power of God, cast into hell Satan and all evil spirits who wander through the world seeking the ruin of souls. Amen.